Day one of Boston Calling was rainy, but it certainly didn’t stop music fans from descending upon Harvard Athletic Complex. With a lineup boasting top rap and indie acts, who wouldn’t brave the mud and rain? Chance the Rapper delivered a jam-packed 20-song performance, Mac Demarco brought a fan onstage and Francis and the Lights danced his way into the crowd's hearts. Chance the Rapper performed every song from his latest mixtape “Coloring Book” (with the exception of “How Great” and "Juke Jam") and still found time to cover a medley of Kanye West songs from “The Life of Pablo” and throw in some “Acid Rap” favorites. Chance rode onstage on a mini-motorbike and kicked into “Mixtape,” complete with popping pyrotechnics and flames as his backdrop. His energy was palpable during his entire set. During “All Night,” the entire crowd, front to back, danced. While Chance performed a punching version of “No Problem,” the word “PHONY” flashed across the screen behind him, likely a knock at the music business and record companies he refuses to be a part of. While one would expect the hype to dip during a song like “Same Drugs,” Chance refused to let that happen. Guided by security, he made his way through the crowd, behind the lighting scaffolding. “There’s way too many people out here. I didn’t know there was this many people back here,” he said. He sat upon a stool before singing one of his most tender songs to his fans in the back, a single spotlight on him. One of the best songs of Chance’s set wasn’t even one of his own. The rapper brought frequent collaborator Francis and the Lights onstage for a performance of “May I Have This Dance.” A newly released video for a remix of the song features the two dancing side-by-side. Chance and Francis Farewell Starlite danced in sync, just as they had hours earlier during Starlite’s set. The screen behind them flashed bright white, creating two dancing silhouettes on opposite sides of the stage. 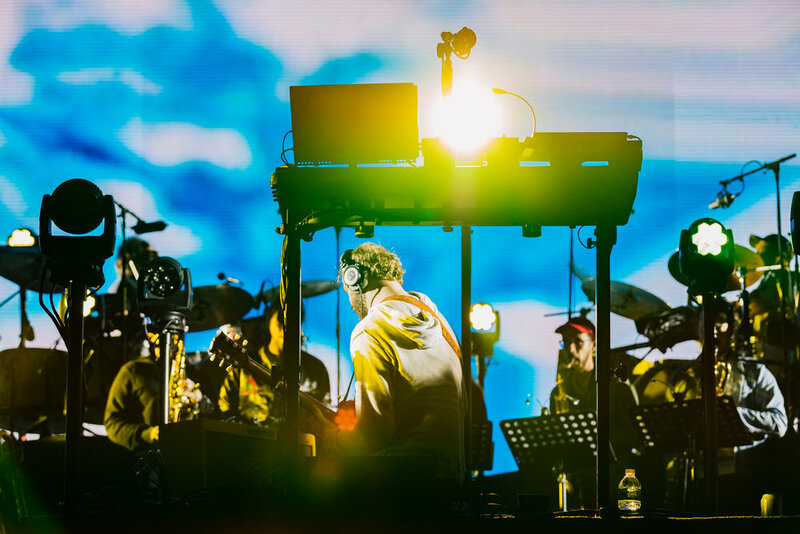 Bon Iver’s marriage of music and visuals created an immersive experience for fans. 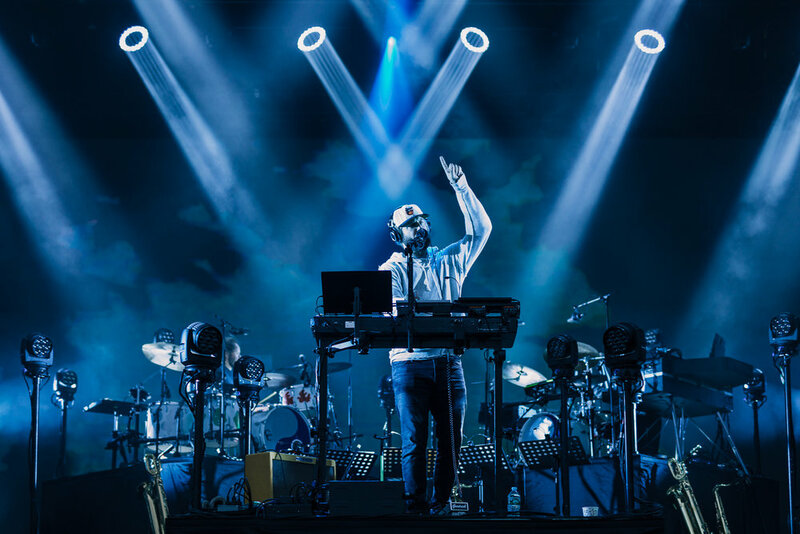 When vocalist Justin Vernon sang in a light falsetto, the lights were calm and his backing band was quiet. When Vernon’s voice rose to a wail, the band reached a crescendo and the lights turned colorful and flashed. Shapes mesmerizingly shifted on the video board behind the band. 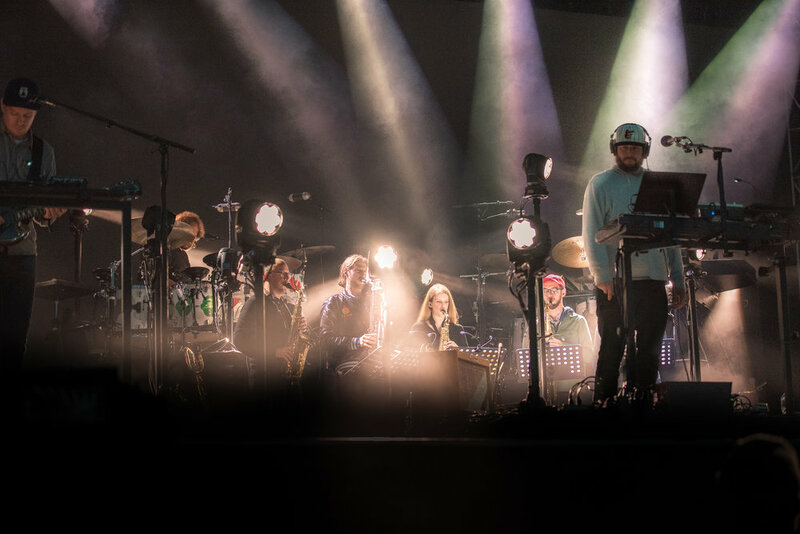 Performing songs from his latest experimental album “22, A Million,” vocalist Justin Vernon utilized the vocal tool Prismizer live. His effect-heavy singing created an ambient setting. It was easy to forget a person was singing; it sounded less like a human and more like another instrument, and it was hypnotizing. The most beautiful moment of Bon Iver’s set came when Vernon sat alone onstage strumming an acoustic guitar to his most popular song “Skinny Love.” The lights onstage illuminated a light rain. When Vernon reached the climax of the song, wailing “Who will love you? Who will fight?” the rain fell even harder. Cheers erupted from the crowd as a chorus of voices sang along. 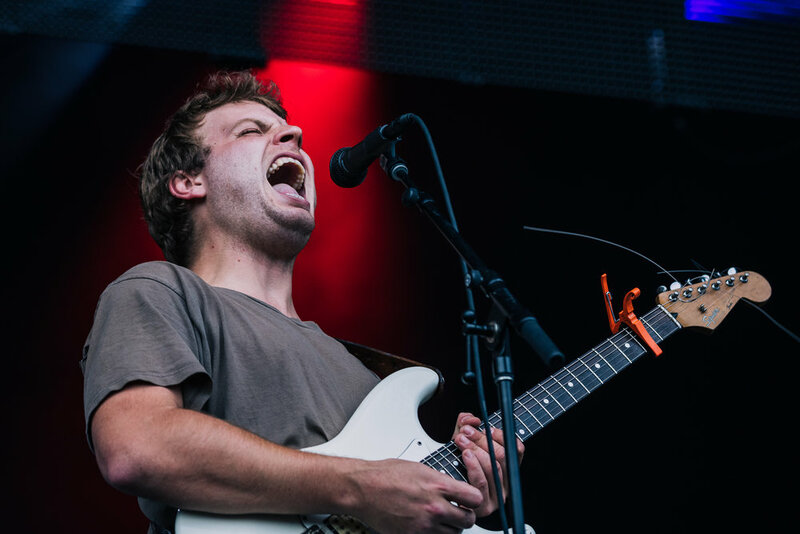 Demarco alternated between drinking Miller Lite and Jameson during his set, drifting one laid-back indie song into another. Guitarist Andy White played relaxed solos over the bouncy indie music as the audience bobbed their heads and swayed their bodies. When Demarco broke a guitar string, his band began a cover of Vanessa Carlton’s “A Thousand Miles,” with White on vocals. Naturally, the band put their own twist on the song, singing only the lyrics, “Makin’ my way downtown,” through the entire song. When a fan held up a sign reading “Jon, I skipped prom for this… Dance with me?” bassist Jon Lent joked they could dance after the show. “Or you could come up now,” Demarco suggested. The eager fan ran onstage only to be yanked back by security. After a quick shouting match with Demarco, security relented and let the fan dance on stage. He even got his dance with Lent, wrapping his arms around him from behind while he played bass. May Francis and the Lights have this dance? For those unfamiliar with Francis and the Lights, also known as Francis Farewell Starlite, there’s really only one thing to know: he loves to dance. Throughout every song, Starlite strutted across the stage. He spun, he windmilled his arms and he dropped to his knees. Make no mistake though; it never gets in the way of his singing. Starlite is pitch-perfect, cutting through the heavy bass with his crisp voice. Starlite’s melding of electronic and indie makes it hard not to dance along. With feel-good tracks like “It’s Alright 2 Cry,” Starlite put a smile on the faces of his audience. At one point, he dove offstage, eliciting gasps from the audience. He began running along the crowd barrier, high fiving each hand held out to him. Chance the Rapper came out to perform the choreography for “May I Have This Dance” with Starlite. The crowd exploded with screams and cheers. Chance couldn’t have been on stage for longer than a minute and he left without a word. Starlite called after him as he left. “Hey Chance! I’ve got something for you,” he said, dropping into a split, leading Chance to break out in laughter and getting cheers from the crowd. Migos’ performance at Boston Calling was announced less than 24 hours before they took the stage. The Atlanta trap trio filled Solange’s spot, after she was unable to perform. 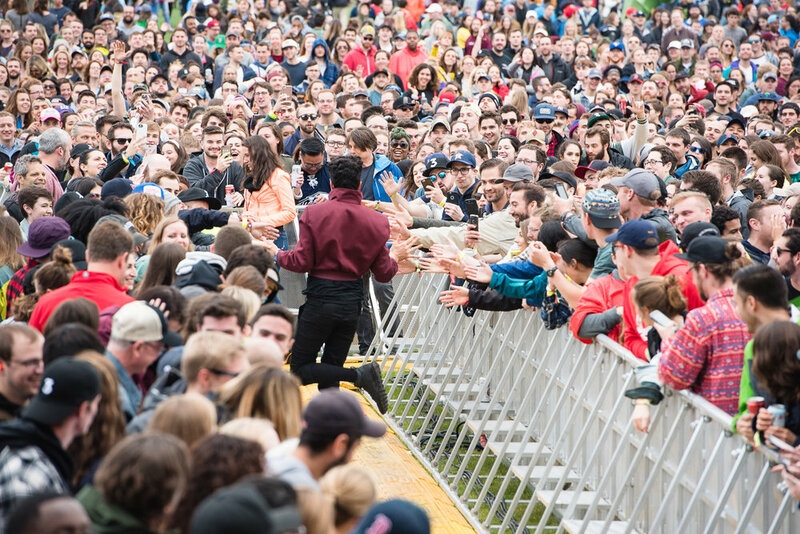 The group performed their chart-dominating songs including “T-Shirt” and “Bad and Boujee.” The crowd formed circles to dance to the bass and beats that could be heard clear across the festival grounds. Fans rapped every word when Migos ordered them to.